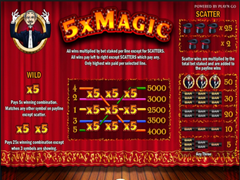 5x Magic Pokie Review - Play Today! Most of us wishes for some magic in our lives. Play’N’Go took that magical idea and created a pokie that offers players 5 X the magic they wish for. Great graphics charms their way into your biggest dreams and the game is irresistible on 3 golden reel with 5 exciting paylines. Great features offers a large of additional wins from wilds, multipliers and top hat scatters. A fantastic payout of 5.000 coins is offered in the jackpot bonus round. The game offers 5 lines that are adjustable. To increase the winning amount you can place up to 5 coins on each of the reels. The game will then offer you a maximum wager of 25 coins. Each winning combination will be multiplied by the bet per line. You can choose the value of the coin as well, which start off at $0.01 to $1.00. Maximum bet will be $25.00. The red velvet curtains is opened to spread magic all over the reels. 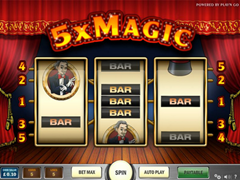 The spotlights confirms that this is the game that offers players 5 X the magic they desire with symbols of the magician dressed in a black suit with a red bow tie, top hats offering secrets to be revealed, X 5 logo in gold, classic bar symbols in black with the triple bar offering gold fonts, the double bar written in silver and the single bar offers fonts in red copper. The graphics offers great detailed displays. On the reels you will find a 5x golden symbol. These are substitute symbol that are available on all the reels during the game. The are also known as wilds and will be able to stand in for other symbols in order to award completed combinations. The 5x also represents the multiplier value that will multiply the combination that its used it. Get 2 of the multipliers and your winning combination will be multiplied by 25x. The magical hat is the scatter symbol you will need to show on the reels in any positions to be rewarded. The hats dont need to show on any paylines to reward you. Your reward from the symbol will be multipliers that can give you up to 25x your wager when at least 2 of them are shown. The pokie is offered with a lot of attention to detail that ensures great game play through smooth spinning reels. The game surprises with the amount of winning spins and generous payouts. This is definitely a pokie to enjoy more than once.